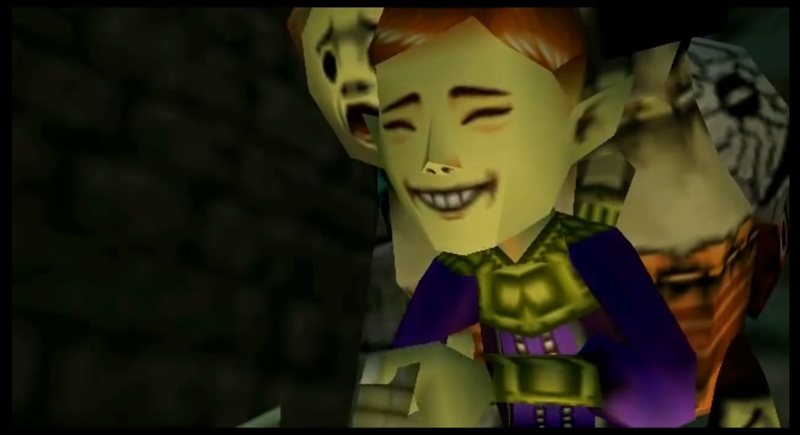 Daily Debate: What Secrets Hide Behind the Happy Mask Salesman’s Smile? The Happy Mask Salesman is always smiling. Always. Even in his distress over money or masks, the corners of his mouth remain upturned. Outside of this characteristic, though, not much is really known of the man. How exactly did he come by Majora’s Mask? How does he know so much about our hero? What sort of things does he know about the world outside his shop walls in Ocarina of Time? What secrets can a man like that hold? I feel he almost knows the truth of the universe — even beyond what will happen if Skull Kid keeps Majora’s Mask — and he finds it all funny. In Ocarina of Time, he grinned at the opportunity to send this kid on a little quest selling his wares, as though there was more to it than Link could ever understand. It’s like the Happy Mask Salesman is just watching the world pass, and watching the people of each land live their lives in blissful oblivion, none the wiser. He’s like a conspiracy theorist that no one pays much attention to, and he can’t help but laugh in the face of ignorance. What do you think the Happy Mask Salesman knows that he isn’t saying? What is he hiding behind that smile? Let us know in the comments below!